Validate your working knowledge of building construction and life safety fundamentals. The NFPA 99 & NFPA 101® Codes and Handbooks Toolkit delivers the information and instruction critical to helping to protect lives and property in your community. Possessing a thorough understanding of benchmark codes for facility construction and operations helps to ensure you're equipped to make more accurate safety decisions in the built environment. The NFPA 99 & NFPA 101 Codes and Handbooks Toolkit provides foundational building and life safety information along with resources and reference materials designed to help you extract practical answers and apply elements of the codes confidently and correctly. This dual codebook and handbook bundle offers comprehensive coverage of essential subject matter developed by industry experts with the keystone materials to comply with the Centers for Medicare & Medicaid Services (CMS) requirements. Demonstrate your proficiency in building and life safety with the NFPA 99 & NFPA 101 Codes and Handbooks Toolkit. Get the educational resources and support materials necessary for establishing and maintaining a safety foundation for any occupancy. 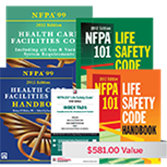 Place your order for the NFPA 99 & NFPA 101 Codes and Handbooks Toolkit bundle today.